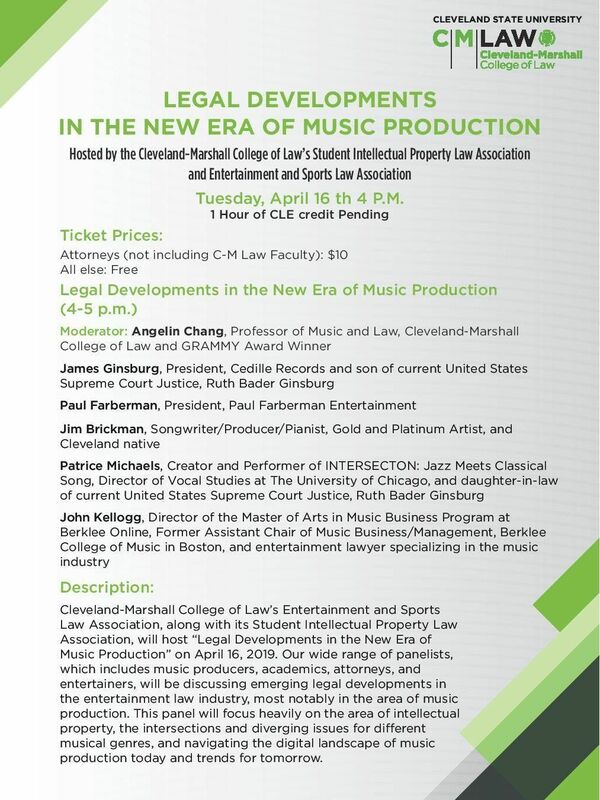 Cleveland-Marshall College of Law’s Entertainment and Sports Law Association, along with its Student Intellectual Property Law Association, will host “Legal Developments in the New Era of Music Production” on April 16, 2019. 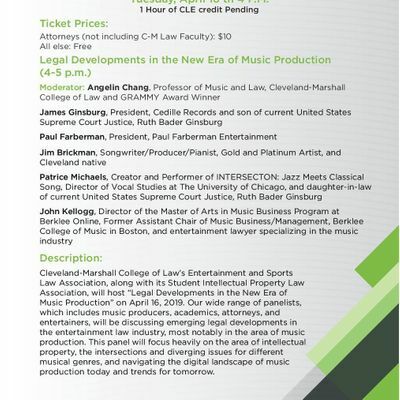 Our wide range of panelists, which includes music producers, academics, attorneys, and entertainers, will be discussing emerging legal developments in the entertainment law industry, most notably in the area of music production. This panel will focus heavily on the area of intellectual property, the intersections and diverging issues for different musical genres, and navigating the digital landscape of music production today and trends for tomorrow. CLE Credit: 1 CLE hour, pending approval. The Symposium will run from 4 p.m. to 5 p.m., with a reception to follow until 6 p.m. Check-in will be from 3:30-4 p.m., and the program will begin promptly at 4 p.m. Please allow a couple minutes to register, find your seat, access the Wi-Fi network, and take care of any other administrative or logistical needs. For those attending, neither the Entertainment and Sports Law Association, the Student Intellectual Law Students Association, or Cleveland-Marshall College of Law are resposible for lost or stole items left. Feel free to contact ESLA's President Aaron Caputo at YSAhIG0gISBjYXB1dG8gfCBjbWxhdyAhIGNzdW9oaW8gISBlZHU=.